This may sound like something you’d expect to read in your newspaper on the morning of April 1st, but there’s no fooling about it. Fujifilm, the photographic pioneers from Japan, have turned their hands to the beauty market and developed a line of skincare products that are landing in the UK next month. 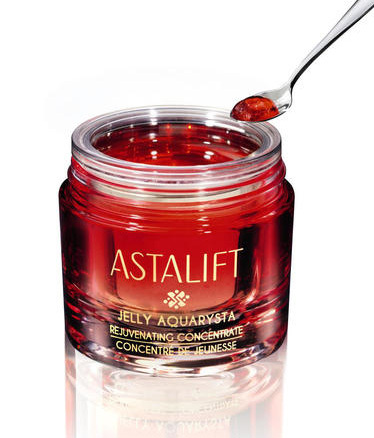 Astalift, which has been available in Japan and other parts of Asia since 2007 offers a comprehensive skincare lineup including: make-up removers, cleansers, serums, eye creams and priming lotions but it’s the Jelly Aquarysta Rejuvenating Concentrate that’s set to be the most anticipated release from the unlikely beauty brand. FujiFilm have taken inspiration from their years of research into how to succesfully harness the power of antioxidants to prevent photographs from fading and applied it to skin. Collagen is as essential to the photographic industry as it has become to the beauty industry, and the brand are hoping to bring proprietary technology in the form of Pico-Collagen (essentially collagen that they claim is small enough to penetrate the skin) to a new European audience. 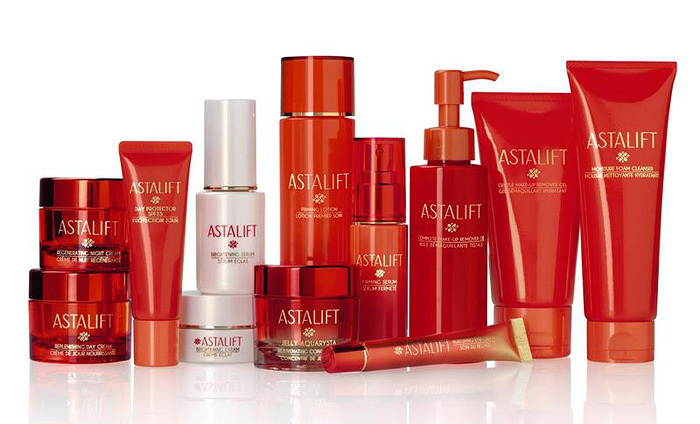 In addition to this innovative nano-technology, the Astalift range contains a naturally occuring antioxidant found in marine algae called Astaxanthin, an ingredient which has been recognised for its ability to protect the skin from ultraviolet light. The most interesting thing to note about this Astaxanthin – aside from its unusual coral-red colour – is that it’s claimed to be approximately 1000x more effective than both vitamin E and CO Q10, the ingredients more commonly used in anti-aging skincare. The range promises to target the visible signs of premature ageing that include dark spots, lines and dull skin whilst stimulating the production of elastin fibres, helping to produce more luminous, plumped-up skin. The brand have just appointed actress Naomi Watts as European brand ambassador, so expect to see the 43yr old actress featured in Astalift’s new ad campaigns soon. I’ve used their face mask and it is absolutely AMAZING. My skin has never been more supple and hydrated with any other mask. It’s super pricey, but I think it’s worth it. I can’t wait to see them arrive in North America.